I want to wish everyone a very successful year for genealogy in 2012. I took some time off from blogging this fall as I am pregnant with my third child. My family is very excited to welcome a new baby girl in April. Genealogy education is still very important to me and so I will resume blogging and posting important announcements in this area in 2012. I look forward to sharing ideas and opportunities with you. I received the following press release from the Association of Professional Genealogists and think this is an excellent educational opportunity. There are seven presentations included in the program, and the conference is conveniently scheduled between the Salt Lake Institute of Genealogy and the RootsTech conference. WESTMINSTER, Colo., December 12, 2011− The early-bird registration deadline is rapidly approaching for the upcoming APG Professional Management Conference (PMC). The one-day conference will be held February 1, 2011 at the Radisson Hotel, Salt Lake City. Members who sign up before December 31, 2011 will receive $25 off of the registration fee. The conference is also open to non-members. PMC is being held one day before the RootsTech Family History & Technology Conference (http://rootstech.org/). 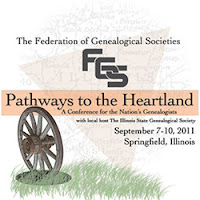 The conference, themed “Techniques, Tools, and Technology,” will feature lectures from top genealogists, including J. Mark Lowe, CG, FUGA; Paula Stuart-Warren, CG; Thomas MacEntee; Teresa Koch-Bostic; Melissa A. Johnson; Laura G. Prescott; Kory L. Meyerink, AG; and Diane L. Giannini, CG. Lectures will provide strategic and practical advice for genealogists, from research planning to earning a living. The conference is open to professionals, aspiring professionals, and anyone interested in networking with professional genealogists. Lecture topics and registration details at http://www.apgen.org/conferences. The Association of Professional Genealogists (www.apgen.org), established in 1979, represents more than 2,400 genealogists, librarians, writers, editors, historians, instructors, booksellers, publishers and others involved in genealogy-related businesses. APG encourages genealogical excellence, ethical practice, mentoring and education. The organization also supports the preservation and accessibility of records useful to the fields of genealogy and history. Its members represent all fifty states, Canada and thirty other countries. APG is active on LinkedIn, Twitter (www.twitter.com/apggenealogy) and FaceBook (www.facebook.com/AssociationofProfessionalGenealogists). The Salt Lake Institute of Genealogy is excited to announce our first ever blogging contest. We believe that SLIG is one of the best educational opportunities available for genealogists—and we want to hear why you think so to. For the next week we would like to encourage all the fantastic bloggers in the genealogy community to let us know why you would like to attend SLIG. The contest will run through Saturday, October 15, 2011 at midnight (Mountain Time). The prize will be a tuition waver to SLIG 2012 (note that only those classes which haven’t filled are eligible). Step 1: Write 500 words or more on the topic of why you want to attend SLIG. Include which course you would like to take, and whether you have attended before. Please include the link www.slig.ugagenealogy.org when referring to SLIG’s website. Step 2: Post a link to your blog post on the UGA/SLIG Facebook Page (www.facebook.com/ugagenealogy) before midnight (Mountain Time) on Saturday, October 15, 2011. If you are not on Facebook please send an email to susanbankhead@msn.com and we will post the link on Facebook for you. Step 3: The winner will be randomly chosen using www.randomizer.org, and announced via our Facebook page on Sunday, October 16, 2011. The winning blogger will be awarded a tuition waiver for SLIG 2012. The waiver is only valid for SLIG 2012 (January 23-27, 2012). The waiver may be applied to registration for any SLIG track for 2012 which has not already filled. The waiver is for tuition only and does not include travel costs, hotel stay, or meals. What if I’m already registered for SLIG? If the winner is already registered for SLIG they will be refunded the amount already paid in tuition (note that this does not include any night classes or meals which may have been purchased). What if I don’t have a blog? Now is a great time to start one! You could write as a guest blogger on a friend’s blog. Note: If you need to post on this blog send me a message. It's time for another installment in our series of blog posts about the Salt Lake Institute of Genealogy (SLIG). Today's guest blogger is Judith Hansen, the Problem Solving Course Coordinator. The Problem Solving course at SLIG is a directed practicum: the student, with the assistance of interested consultants and peers (fellow students in the group) enhances and applies specific methodology, analysis, and evaluation skills to the student's personal research. The format of the problem solving course is designed so each student receives specific help on his/her own project, learns from studying the submissions of the other students. and from discussing research and methodology with the other students and professionals. Each problem solving student chooses his own curriculum--focused on one ancestor, ancestral couple, or particular genealogical question. Choose a problem that is of personal interest and is not under constraints imposed by others. Research being done for hire or for possible submission to BCG or ICAPGen should not be used. The Problem Solving course takes place in 3 parts. After registering and before Oct 30, each student submits a Problem Solving Project, with the following elements: a short 1 page summary of the Problem, pertinent research logs, family groups, pedigree, maps, time line, and five page report about the research problem being submitted. During SLIG daily meetings are held with the assigned group to discuss the problem, offer suggestions, and debrief on the previous day's research activities. After SLIG each student completes a new written summary of their research project, discussing sources used, new findings or lack of findings, conclusions and what to consider next in future research. IF at the end of SLIG week, the group consensus is that research possibilities have been exhausted for the problem, leaving no further avenues to pursue, the student is encouraged to put the project on the shelf--writing a final evaluation report which states final conclusions with supporting evidence, and details research steps, sources and analysis. The summary should be shared with those interested, including fellow PS Group members and consultants. As a Problem Solving student one is 1) a researcher, evaluator and reporter for their own research, 2) a peer within the group, providing encouragement and suggestions, 3) a student of the comments of consultants and peers, 4) a teacher sharing their own expertise with others when needed, and above all 5) a genealogy friend. Often the encouragement a genealogist needs is validation: someone else to look at their research, evaluation, and analysis – am I on the right track? Do conclusions make sense? What data or pertinent records are missing? What are the flaws or misconceptions in evaluating data and sources? What is needed to resolve conflicts or discrepancies? For some it may be “a safe place” where others will listen to their genealogy stories and concerns.